CivilizationByzantine, Medieval , 1400 C.E. The Book of Daniel is one of the most loved and treasured books in the Bible. Not only is Daniel revered as one of the great ancient Hebrew prophets of old, but the Book of Daniel is seen as the key to deciphering the symbolism of the Book of Revelation in the New Testament. 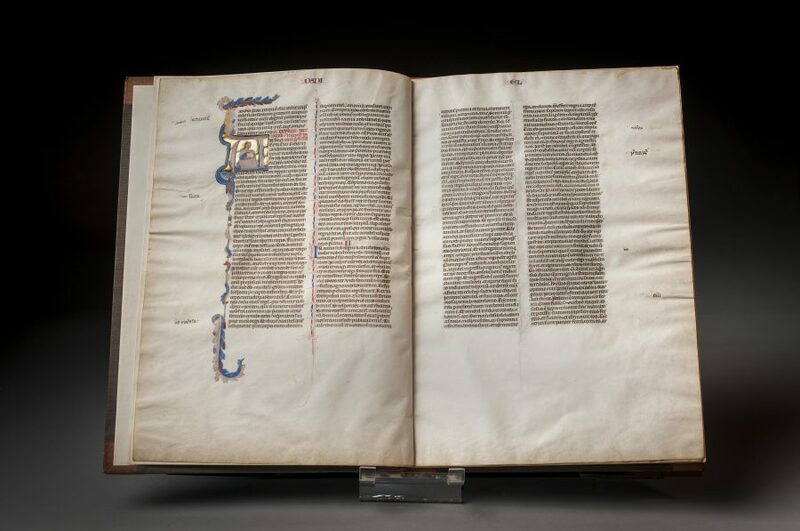 Among ancient manuscripts, a manuscript of the Book of Daniel is considered to be a very special and rare treasure. In this Byzantine manuscript from medieval times, a portion of the Book of Daniel is preserved in ten folios as it was written circa 1400 C.E. Coming from Italy in the 2nd half of the 14th century CE, this book measures 320 x 227 mm and includes 10 leaves. Each leaf/page has two columns of 48 lines written in black ink in a round gothic bookhand between four verticals and 49 horizontals ruled in plummet. 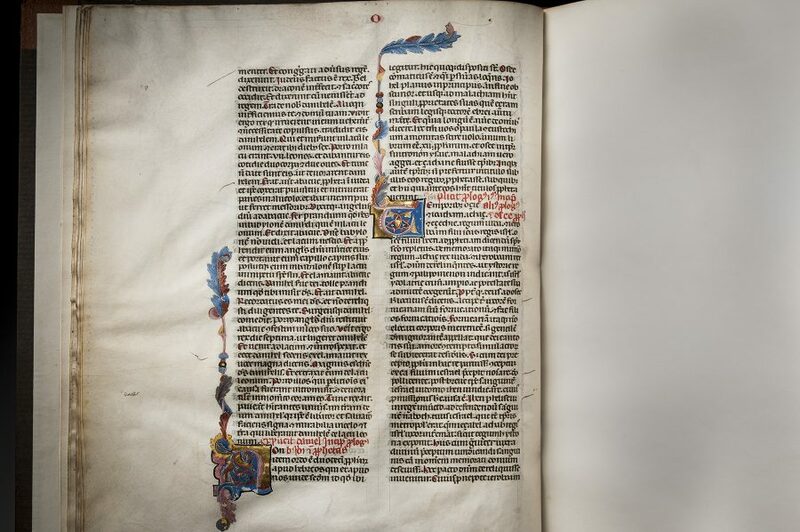 There are rubrics of red, letters of running headings and chapter numbers alternately red and blue, initials of red or blue with cusps and flourishing of both colors extending beyond the height of the text to open each chapter. TWO ILLUMINATED FOLIATE INITIALS and HISTORIATED INITIAL WITH TEXT-HEIGHT ACANTHUS BORDER in pastel colors and burnished gold (tiny area of dampstaining at top of margin of first three folios). 20th-century half pigskin (slightly rubbed at extremities). These leaves must once have been part of an extremely handsome and elegantly produced folio Bible. The delicate forms of the acanthus sprays, their twisting leaves turning from pale blue to pink and orange and from yellow to orange, point to an origin in Umbria, probably Perugia, around the middle to third quarter of the 14th century CE. 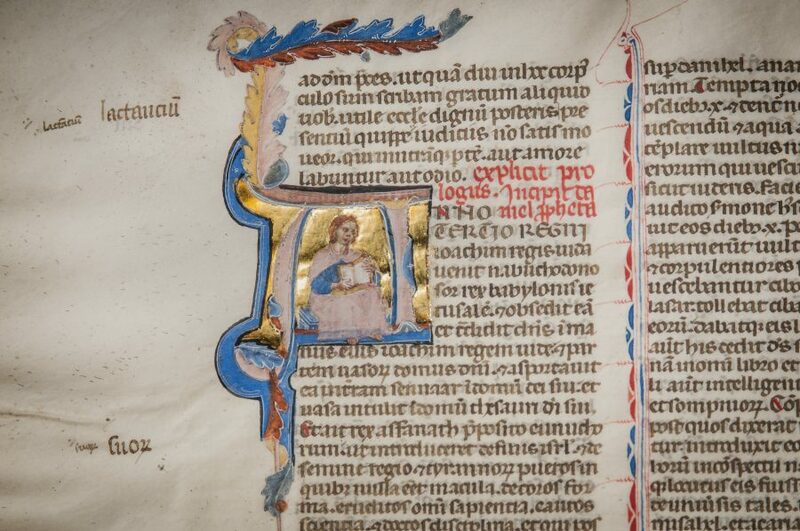 Serious collectors and connoisseurs of old bibles, old manuscripts, and specifically old bible manuscripts will certainly appreciate the value of medieval illuminated manuscripts such as this one of the Book of Daniel. 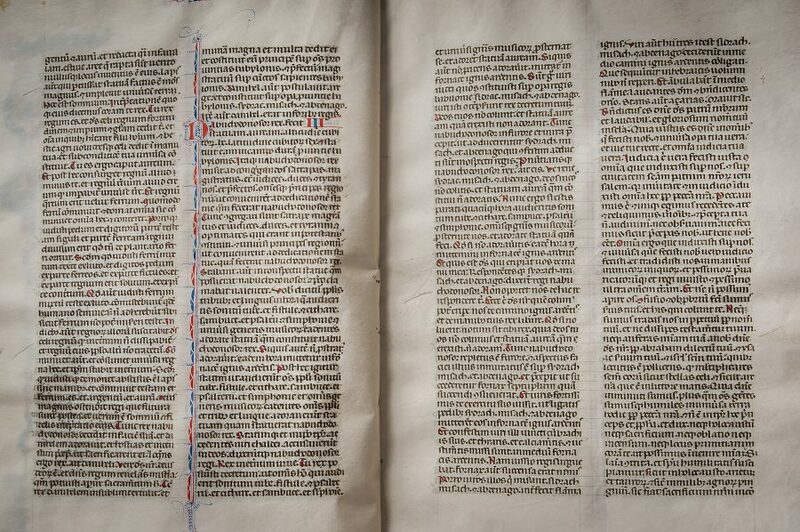 A rare manuscript treasure such as this one makes an outstanding addition to any fine book collection. The Reverend Anson Phelps Stokes (1874-1958): bookplate inside front cover. 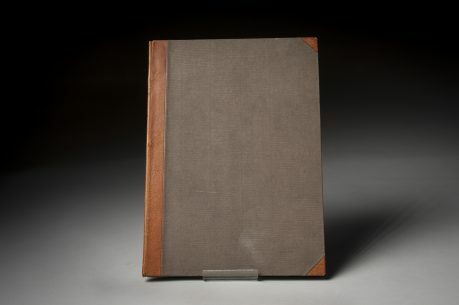 The noted clergyman in New York and New England, who also directed the philanthropy of his family’s foundation, had this manuscript as no 5 in the listing of his books, De Ricci and Wilson, Census, II, p.2276, where its acquisition from Goodspeed in 1935 and the presence of the Book of Job from the same manuscript, then in the Goodhart collection, New York were also noted. The manuscript passed from his son, the Reverend Anson Phelps Stokes II (1905-1986), Bishop of Massachusetts 1956-70, to the Episcopal Theological School, which in 1974 became part of the Episcopal Divinity School, Cambridge, Mass. Book of Daniel ff.1v-10v, preceded by the incomplete prologue to Daniel (Stegmüller 494) and followed by the prologues to Hosea (Stegmüller 500 and 507).